So, our recovery it seems is gradually taking hold. Fragile as it may be, it has been hard won and should be seen as a major achievement of both the citizens and the elected government. The troika has left and we are once again notionally the boss of our own selves. However, with the EU ever watchful and with the requirement that our deficit be brought into line, there continues to be much in the way of external and internal risk that might derail our gradual return to economic health. The external threats are somewhat beyond our control and it would seem to me reasonably obvious that we should continue to focus, judge our progress and hold ourselves accountable for how well we do on managing and reducing risks from within, in other words, those that are directly controllable by the state, its government or its citizens. Then, if an extraneous shock does occur, we are at least in the best possible shape to deal with it. What do I mean by that? Well in a small open economy the current economic uplift in the UK is very helpful, as is the news on unemployment and other stats from the USA and the stabilization in the EU. However, it is not difficult to see how a downturn in the USA or a sudden UK exit from Europe or the recent instability of a Portugese bank might have an impact here. Should any major shock occur we could largely only control such a circumstance after the event. Therefore, for today, I have picked two major threats to our recovery that I believe arise within our own little island but also just as importantly, two that are within our collective control. I want to start with a few figures and, while I don’t want to get too bogged down in numbers, it does help, I believe, to anchor the current economic conversations in a reasonably tough reality. These numbers represent what people mean when they talk about recovery. 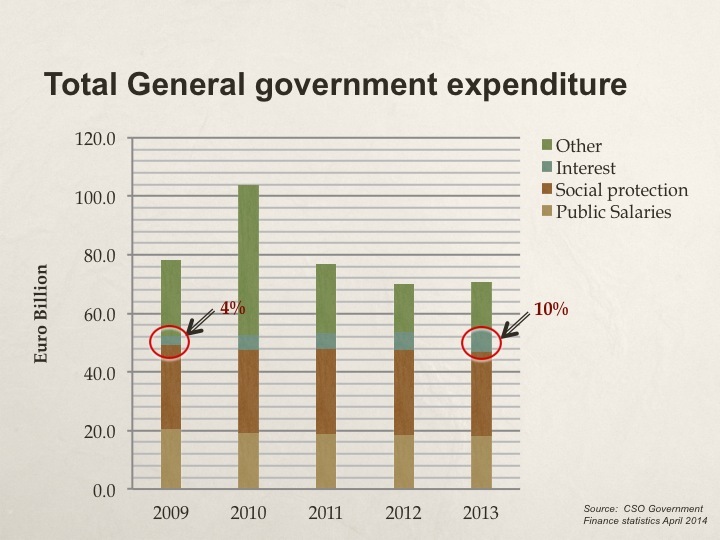 After 5 years of property taxes, Universal Social Charge, VAT increases, water charges, imminent, Croke Park I and II, Haddington Road and double digit unemployment rates, medical cutbacks and pupil teacher ratio changes and SNA’s gone from classrooms in 2013, we spent €11 billion more than we collected in taxes. Having come so far and done so well, and really this chart does represent a significant and considerable success, the risk is really that we have grown tired of it all or that we haven’t focused enough on these numbers or maybe that we have oversold the success to ourselves and to others and that many believe it is now all ‘over’ without realizing how much of a long haul this is. 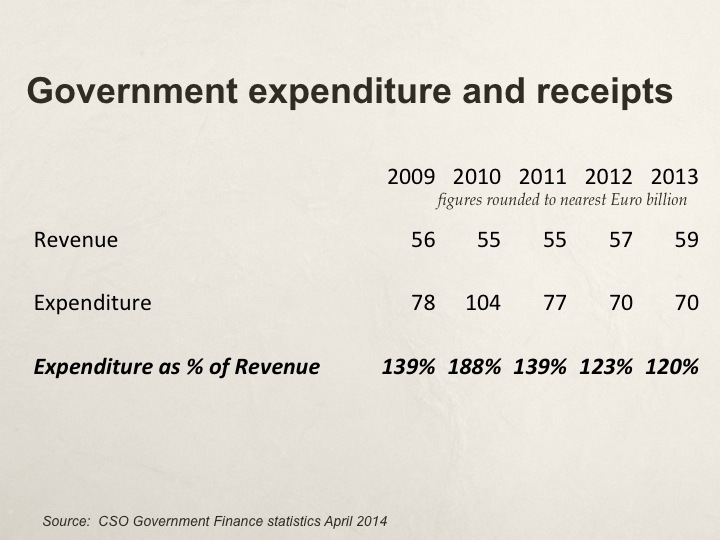 As this chart shows, current expenditure excluding interest on debt stands at 107% of revenues. Obviously, what is not covered by receipts must be borrowed. So getting aggregate tax receipts up and keeping aggregate costs in check is the only way to stop the interest bill growing. 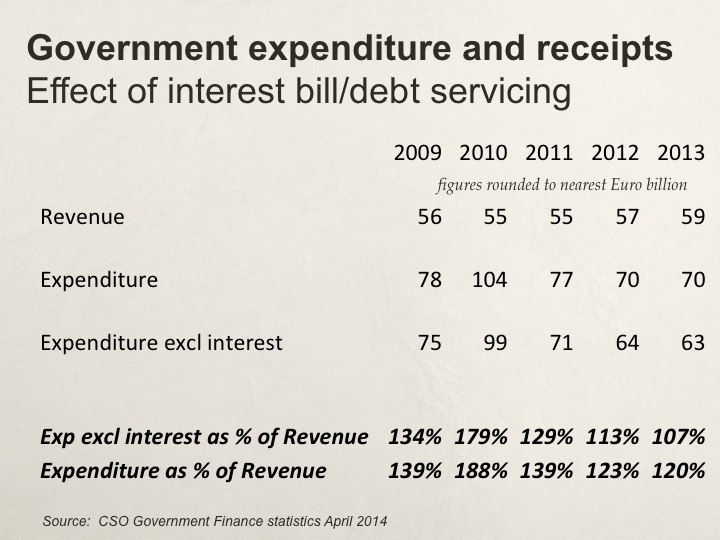 Expenditure including interest payments is still 120%. After five years of correction and collective sacrifice, our government, on our behalf, spends 6 euro for every 5 it collects. This is where the public discourse sometimes starts to become a bit disconnected from the harsh reality of these figures. What we have taken to calling, in a somewhat lazy shorthand, ‘an Austerity policy’ in Ireland, is not a policy choice unless we think that spending 7 euro for every 4 would somehow be ‘a policy alternative’ to our current 6 for 5. In this regard, I listened to two experts on our national airwaves the other day. These experts were an RTE interviewer and a politician who shall remain nameless (to protect the innocent). The interviewer asked the politician if the next budget was “an opportunity to deliver a tax break instead of paying down debt”. As if that was the choice! As these figures show the choice is between tax breaks and growing the debt by a few billion or bigger tax breaks and growing it by a few billion more. Borrowing more under our current debt levels may silence those lobbyists looking for a short-term result for their particular constituency. It may even deliver very short term relief for some hard pressed lucky few. It will undoubtedly make for an easier political term for an elected government but it is not, I believe, collectively in our medium or long term interests. And when it cannot be delivered on sustainably, it will need to be reversed. The hard slog is not over. We are simply not there yet! Too much more borrowing will mean that the public purse will become unstable (given current debt levels) and, crucially, it will constrict future policy choices (both on taxes and on spending) as the debt must be serviced. In the event of an extraneous shock from a non-controllable source, as mentioned earlier, it would render the situation precarious. Arguments for capital investment do exist and there are certainly many policy choices to be made around types of taxation and levels of expenditure particularly those policies that encourage job creation and employment and thus promote growth. But in my view there is little or no case to be made for rowing back or easing off on the path to right the public finances. Given the hardship experienced already by so many, health service and education cutbacks, the increased taxes, public service pay cuts this is not an easy or palatable message. In fact, it is really a bit grim! But the hard reality is that we are in this for the long haul. In the absence of a game changing deal on our debt (which seems increasingly unlikely) and given the current growth rates here and worldwide, it will be quite some years before our public finances can be described as robust and it will require continued discipline and vigilance. Until then, there is little leeway for increasing aggregate expenditure or reducing aggregate tax take. What we have instead is many important policy choices around extracting best value for money we can from our public sector spend, tweaking individual taxes to ease the pinch on those worst affected, policies that support viable jobs and encouraging those that have it to spend. And isn’t it here the public debate should be focused now? I believe the first real and primary threat to our recovery is that we lose discipline and indulge ourselves in a couple of rounds of vote-buying budgets or similar Dutch auctions in the run up to the next election. Rather than depressingly familiar calls for tax breaks and an end to so called austerity, if it is the case that every democracy gets the government it deserves and whilst appreciating the delicate balance required, I wonder might we have modestly more courageous politicians were we to collectively better develop the stomach for hearing the tough stuff and to insist on real reform in how annual budgets are developed and spent and clarity and transparency in public debate on these issues? Second major threat I would like to touch on goes to the heart of reform in the financial services system and touches on a subject on which I have been vocal over the years in the Central Bank, namely house prices and the banks. So there is now a year on year increase in parts of Dublin of 22%. This is patently not a sustainable rate of growth. However, some house price recovery does help a lot of people – it helps the government and the economy generally – lots of people feel a bit better about their largest asset, feel a little more confident and, in turn, are more likely to spend and contribute to tax coffers as a result. (remember there is over 100b in saving accounts in Irish banks). Secondly, it helps all those unfortunate folk who are mired in negative equity and suggests a pathway (albeit over time) to recovery. It may even encourage others to sell and thus free up supply. Finally, it also helps the banks and not insignificantly. In all stress test modeling a key assumption of the capital models is house prices. Any uplift in house prices directly increases the collateral value on loans. As much of the arrears book is now so late that the bank must provision down to the collateral value this effectively establishes a floor value for that loan. Increasing house or commercial property prices increase the value of the loan held thus directly limiting the likelihood that more capital will be needed in the banks before the stress tests later in the Autumn in advance of ECB taking over the regulation of the Banks (under Banking Union). In addition, a new generation of buyers is now entering the market for the first time as they believe the worst is over and so as an added benefit, there is opportunity for the banks to lend again and thus make profits. More construction activity means people are back at work and so tax revenues rise. So potentially, no further capital needed and some talk of rising tides, everyone is happy… indeed what’s not to be happy about. Except haven’t we been here before? However the hopelessly indebted are still not dealt with. Whilst there has been some improvement in major urban areas, the rest of the country has yet to feel the benefit. In addition, the system starts to feed off itself and the seeds of financial instability are sewn again. These conditions have the potential to develop into another asset bubble. It is interesting to note that at this time with stress tests on the horizon and asset values just starting to experience some up-lift, talk of a ‘recovery’ and with many of the current house purchases driven by cash buyers that it would take a brave regulator indeed to impose lending limits, income multiples or other so called counter cyclical buffers in an attempt to dampen rising prices (if they believed it necessary). Can you imagine the hue and cry? So when the time comes to intervene (and sooner or later it surely will) it is for sure that the regulator will need to be politically and socially ‘tone-deaf’. There is certainly unfinished business in the arrears of both SME and Mortgage loans. The next great threat to our recovery is how we are going to deal with these persistent long term arrears 6 years on. One in six mortgages on family homes (17%) has some level of arrears on their loan. One in twelve have arrears of more than one year. This threat is both a threat to the stability of the system, social cohesion and more directly and personally to those directly involved and, living with that over-indebtedness, usually to multiple lenders. The insolvency service, the change in the law after the Dunne judgement, the operational capability in the banks are now in place. The mortgage targets have made a public spectacle of the banks’ progress. So where are the deals? How have other debts been dealt with? What happens the credit union sector or small businesses as the losses crystallise? What is to happen to those ineligible or unable to avail of the insolvency services? How will we deal with inevitable repossessions and voluntary surrenders? I believe how we deal with these questions will be the defining legacy of the banking crisis for society, for the economy and for the families affected. Right now, it remains unfinished business and there is much work to be done to avoid the risk of this drifting further. There is much that is right in Ireland in terms of opportunity and much that we can be proud of. We should rightly give ourselves credit for a lot of what has been achieved here including the enormously difficult last few years. But there is also much by way of unfinished business for the over-indebted generation that must be dealt with and much by way of change required in how we collectively do business in the political sphere on economic policy choices. Moving ahead though and before we sow the seeds of the next issue, promise tax cuts that can’t be responsibly delivered, ‘ease off on so called austerity’ or allow house prices run unchecked because it makes many of us feel a little better about the family finances or worse allow further drift on arrears crippling those businesses and households affected – we need to decide we will do it differently this time. Having saved the system, how many of us would much rather we had reformed it? We can decide we will have the debate that will allow the hard choices, that we can and will vote for politicians who have the discipline to stay the course and that our politicians will discover (or continue to display?) said discipline. Unfortunately, we have not collectively shown this determination much in our economic history. But having failed so spectacularly this time, it is to fail again not to show it now. And so, I continue to live in a somewhat fading, slightly tarnished, hope that we have not wasted our crisis. So it was back to the hard slog, pushing myself up the hill.